Applied adhesive and secured the forward carpet. It really bothered me how flimbsy the upper baggage area is around where it meets the control tunnel. In looking at it from below through the hell hole, I noticed that it would not take much deformation in that area to cause interference with the elevator/flapperon control. I know this would always bother me in case a load shifted and caused a problem, so I decided to do something to prevent it. I had some 1/8" angle stock around, so I cut a 80cm length. I drilled between the existing rivets and attached it to the edge. 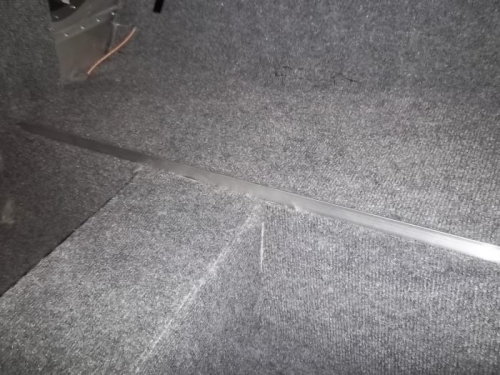 Although the primary purpose is to prevent deformation at the tunnel intersection, I also tucked the edge of the carpet underneath to clean up the carpet edge. 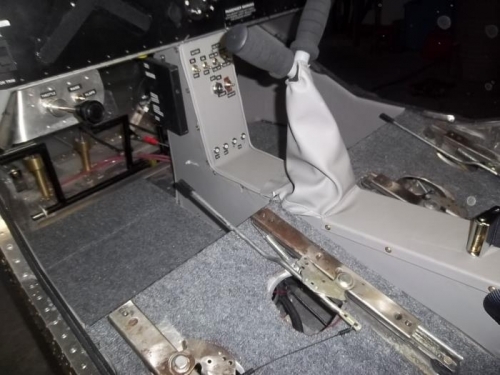 In addition, the angle provides a raised lip to help keep anything on the upper baggage area in place. The whole baggage area now feels much more solid and I shouldn't have to worry about accidental deformation interfering with the controls.